You know how the media is on it when it comes to a festival, holiday etc. Well, the other day when I was watching the soap ‘Desperate Housewives’ on television and the character Susan kept saying Leprechauns it din’t strike as significant. However, reading about St Patrick’s Day I understand now. Leprechauns are dwarfs according to Irish folklore and if you catch him he is supposed to give you a crock pot of gold. Forgetting folklore and soaps St Patrick Day is a Irish holiday in honor of St Patrick. Green is the color of the day. 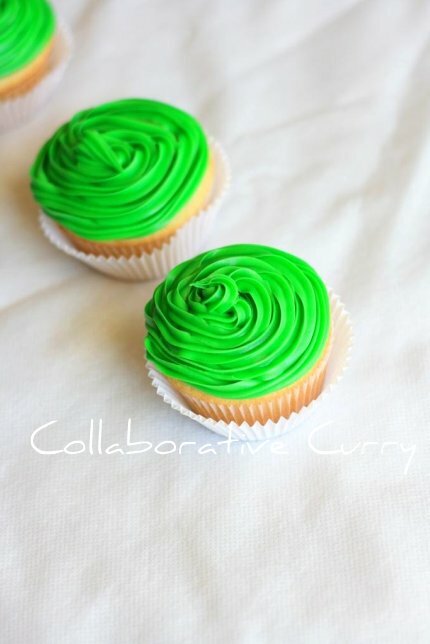 We are not far behind we have cupcakes with green icing for you. . I know this is not something Irish, but green enough to make my kids happy on St.Pat's day My daughter has been behind me to get some of the icing and at my weakest moment I gave in and bought some. I say, it was worth it. Holidays and festivals are always welcome so all you Irish and everyone else out there Happy St Patrick’s day! 1.Preheat the oven to 350 degree F.
2.Line the muffin trays with paper liners or grease them. 3.Whisk the flour together with baking powder and salt. 4.Beat the butter and sugar well, until smooth and fluffy. 6.Add the flour mix and mil alternately and beat at low speed to mix. 7.While doing this ,start with flour and end with flour.I added the flour in 3 parts and milk in 2 parts. 8.Spoon into the tray and bake for 16-18 minutes or until a toothpick inserted comes out clean and the sides start turning into a nice brown color. 9.Decorate with your favorite frosting and enjoy ! 1. The butter and egg should be at room temperature, for best results. 3.The recipe says,this is for 12 cupcakes. But I ended up with 16 standard size cakes. 4.The cakes were perfect, light and fluffy, just the way I wanted. The white flowers you see are Shamrock flowers and also some Shamrock leaves which are significant of St.Pat's day, for you !! Love the color. Who can resist cupcakes? I bet the kids were overjoyed. VERY PERFECT! IT'S VERY ENVIRONMENT-FRIENDLY! NICE CREAMY GREEN CUTE CUPCAKES! even i like watching desperate housewives.. beautiful green cupcakes..
Beautiful beautiful cupcakes...colorful they look!!! I learnt about Leprechauns when my son was in Kindergarden. The color and presentation is perfect! Beautiful and colorful cupcakes..Awesome clicks! Mindblowing clicks. Very nice presentation. Love the recipe. These cupcakes are stunning! You got the shade of St. Patrick's green perfect! Cup cakes are beautiful! I keep forgetting that it is St. Patrick's day today. I should change to something green! Perfect... who doesnt love a cup cake... I jsut had one for mother's day!! Thanks for stopping by my blog. You have an amazing blog here. What photos you have captured of food. It makes me hungry. Thanks for sharing. Lovely color, looks beautiful and yummy. Nice click. Aaah... What lovely cupcakes, so brilliantly captured! These would surely tempt even the most fussy ones too! Lovely cup cakes,icing looks so perfect, color is awesome...great work namitha. Awesome looking cupcakes! Hoping you are having a terrific St. Patrick's Day. The cupcake looks so colourful.....wow....and nce pics as usual..
Wow the swirls on the cupcakes looks exquisite namitha.Good way of sharing info with all of us. what a bright color....excellent photograph..love the cakes..
Lovely colour n cupcakes came out very well. what devine little cup cakes.So cute. 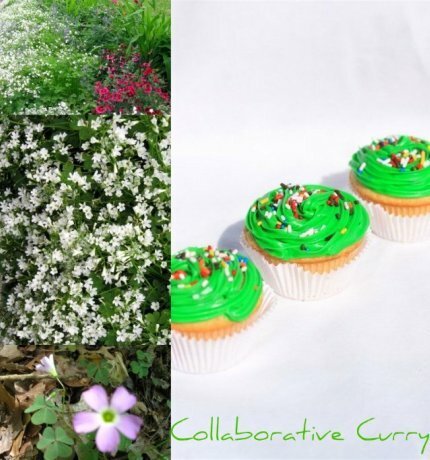 Adorable cupcakes and lovely St Patrick's Day post too. Thanks so much for stopping by to visit my blog...I have signed up to follow you too. I look forward to getting to know you better. SPRING! These cupcakes are really looking wonderful! Hey...wow ..these are so cute and adorable cup cakes..!! Hey, everyone is Irish on St.Patricks Day! I used to read about leprechauns as a kid, and always went looking for the end of the rainbow for that elusive pot of gold! Nice ones. You could send them to my 'Bake-Off' event if you wish. 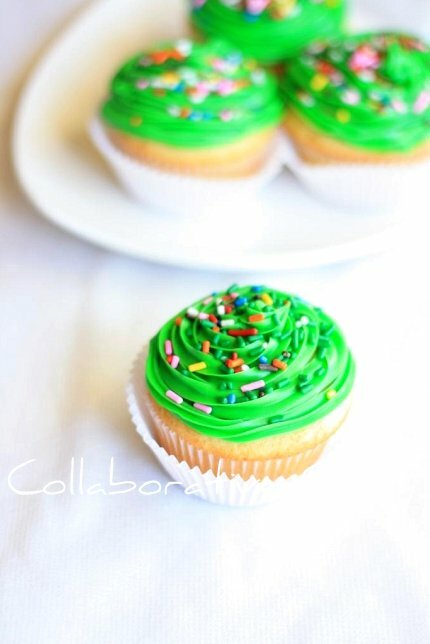 WOW very tempting cup cakes... love the green color. Got it. Thanks. It will be posted this friday. 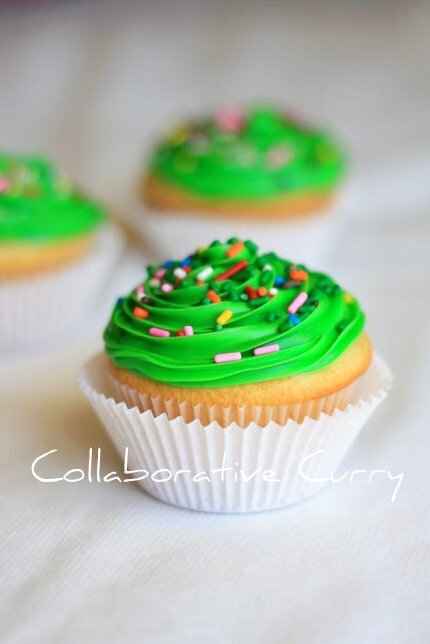 Your cupcake is beautiful, very nice green colour.Today I going to make chocolate cupcake! They are green, and such a vibrant green for the holiday! I only wear green because I work in an elementary school and the kids expect it! These are pretty cupcakes! Your cupcakes look absolutely amazing! Thanks for short and easy recipe. Are you sure they are not from a famous bakery shop??? Gorgeous vanilla cupcakes! Love the bright green frosting! wow!!!!!!! What a colourful recipe. Great. Cupcakes look so so pretty! the cutes set of cupcakes I ever saw...what else can I say! They must be one of the cutest cupcake I have seen! Even the plain one is stunning! veryyyyyyyy cute and colourfulllll cupcakes dear! Lovely color! Absolutely great for Paddy's Day celebration. Even your cupcakes are perfect. Wow. I love that bright green - adorable! what a perfect hue for st. patrick's day...i just want to grabe one hihihi! Oh My!!! Oh My!!! They look so perfect and yummy!! St Patrick Day to you too dear!!! Thanks for dropping by. I appreciate ur valuable comment. ur cupcake look mouthwatering and pics are excellent. looks perfect!!! awesome pic..the best pic ive seen on ur space! You guys have done an awesome job with the icing...hat off to your daugther :)....the cupcakes are gorgeous! Nice cupcake.. love them..and yes nice pic..looks really delectable.. Perfect perfect cupcakes...loved the colour....u have such an amazing blog!!! I made very similar vanilla cupcakes with green frosting for my daughter's kindergarten class yesterday! hey any green goes wonderfully on St. Patrick's day and this is just such a delicious one too at that! love your presentation and the colorful pictures. What a lovely color !! Cake looks awesome ! !